"I'm not so sure the Civil Rights Act would have been passed had there not been a St. Augustine"
On June 18, 1964, J.T. 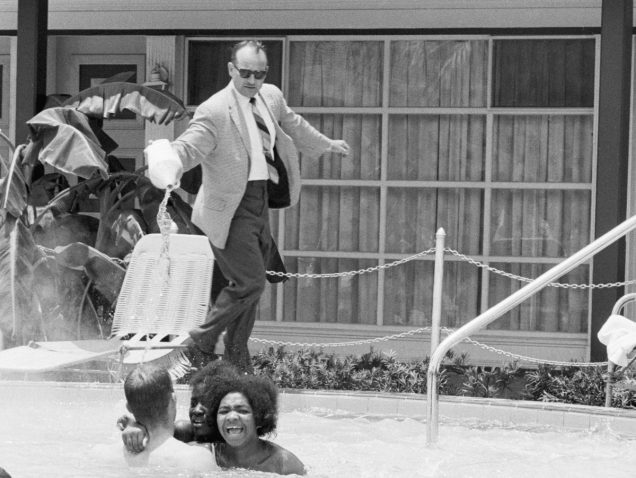 Johnson (L) and Al Lingo (R) were two of several protesters who jumped into the whites only pool at the Monson Motor Lodge in St. Augustine, Florida. At StoryCorps, they talk about how the owner of the hotel tried to force them out by pouring acid into the pool. Originally aired June 13, 2014, on NPR’s Morning Edition. AL: He really lost it. JTJ: He did. Everybody was kind of caught off guard. AL: The girls, they were most frightened and we moved to the center of the pool. JTJ: I tried to calm the gang down. I knew that there was too much water for that acid to do anything. Also knew we wasn’t gonna be in there long, that someone was gonna drag us out of there. When they drug us out in bathing suits and they carried us out to the jail, they wouldn’t feed me because they said I didn’t have on any clothes. I said, “Well that’s the way you locked me up!” But all of the news media were there because somehow I guess they’d gotten word that something was gonna happen at that pool that day. And I think that’s when President Johnson got the message. [Archival audio of President Johnson]: Our whole foreign policy and everything else could go to hell over this. Yesterday in the swimming pool in St. Augustine they started pouring acid in the pool. JTJ: That had not happened before in this country, that some man is pouring acid on people in the swimming pool. But it was just something that had to happen and it happened. And I’m not so sure the Civil Rights Act would have been passed had that not been a St. Augustine. It was a milestone. We was young and we thought we’d done something — and we had. But about 40 years later, I went back to St. Augustine. And there’s a Hilton Hotel where the Motor Lodge used to be. And I sat and talked with the manager. I said to him that, “You know, I can’t stay in this hotel. You don’t have any African Americans working here.” He said, “Well I promise you that next time you come down here it’ll be different.” He immediately got busy. But he was one of the few people in St. Augustine, I think, that did some of the things that we had been talking about. So, to go back to St. Augustine and it’s still somewhat the same, now that does make me feel bad. The lifting is still kind of heavy, but I’ll continue to work as hard as I can as long as I live. I won’t ever stop, and I won’t ever give up.